In the summer of 2015, Volta Industries, a designer of vehicle charging stations aimed at bettering the world one community at a time, was looking to make a change. The company was embarking on a transition from static to digital signage as well as an expansion of its charging station locations to retail centers across the Midwest. 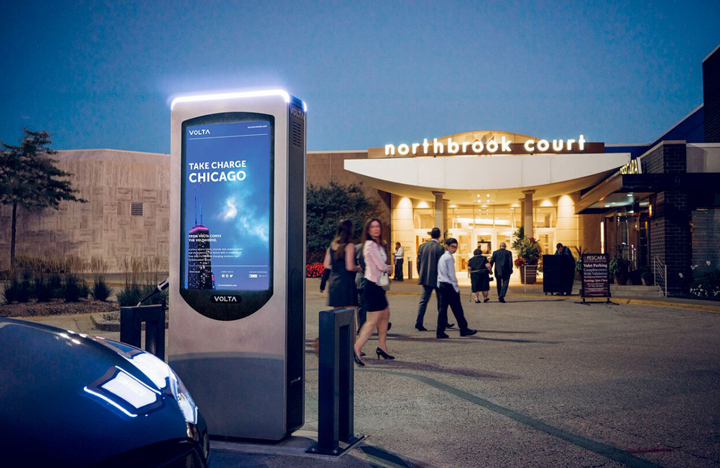 Volta wanted to combine digital signage displays with its electric vehicle charging stations to create the ultimate revenue generating, advertising solution. Further, Volta wanted to stick to its mission of offering free electric car charging to customers and free installation and maintenance to retail centers with its ad-supported stations. Volta’s desire to combine charging stations and digital advertising would prove to be very beneficial for the company, particularly because digital advertising is shown to be more effective than static advertising. A recent study found that sixty-three percent of adults report that digital signage advertising catches their attention more than any other method of advertising, and forty-four percent said they paid more attention to digital signage advertising than any other method of advertising. In hopes of growing its business by adding digital signage solutions, Volta needed to find reliable and secure digital charging stations that would be fully operational in the harsh outdoor environment of the Midwest, namely Illinois, while still offering retail centers a way to digitally connect with ecofriendly customers prior to entering their stores. In addition, based on its mission to cover all station costs, Volta was focused on finding a product that offered ease of installation, maintenance, and security features to deter tampering or theft. Peerless-AV’s digital charging stations easily withstand the extreme outdoor elements of the Midwest. The Xtreme™ Outdoor Display and Kiosk’s fully-sealed weatherproof design completely seals all inside components including cable entry, providing the utmost protection against outdoor conditions such as rain, snow, sleet, dust, insects, and even pressure washing. The Xtreme™ Display is IP68 rated, which means the internal components are completely protected against outdoor elements such as water, dirt, or dust. The operating temperature ranges from -40°F to 140°F, ideal for the temperatures in Illinois. Plus, the patented Dynamic Thermal Transfer™ system passively cools and thermally heats the display, eliminating the need for filters, vents, or fans. Corrosion was also a non-issue for the stations as the kiosks were designed to be all stainless steel with aluminum construction. Assembly is made easy with Peerless-AV kiosks, so it was no surprise that the stations were designed to arrive pre-assembled to simplify installation. Ease of maintenance was another aspect Volta requested, a key marker for all Peerless-AV products. Secure, removable doors on both sides of the unit allowed for convenient access to the display, media player, and other internal components. Once inside the unit, there is a fold out tray that can be used to place tools on while working on repairs. Peerless-AV is proud to have a fully staffed custom solutions team that works diligently to create solutions, such as the Volta charging stations. The kiosks were designed with the end-user in mind and the final solution had design and maintenance at the forefront, offering sleek, modern, digital charging stations. The stations are two-sided, which allows for digital advertising on one side and static advertising on the other. The illuminating blue light located at the top of the kiosk allows electric vehicle drivers to easily identify where a charging station is located within a crowded parking lot. Also, the stations are equipped with an EKM power meter for charging and a cellular modem that allows for real time content updates and power consumption records. Peerless-AV®, a Peerless Industries, Inc. company, is a leading designer, manufacturer and distributor of audiovisual solutions. From its award-winning mounts and wireless audio systems to indoor/outdoor kiosks and the industry’s first fully sealed outdoor displays, Peerless-AV aims to Get it Right by fulfilling both integrators’ needs for ease of installation and service, and end-users’ dreams in residential and commercial applications. Based in Aurora, IL, Peerless-AV manufactures over 3,600 products that serve original equipment manufacturers, commercial integrators and consumer retailers in 22 vertical markets through direct sales representatives and authorized distribution. For more information, visit www.peerless-av.com.